In our upcoming plein air workshop, for most of the students, it will be their first experience painting out of doors. I want it to be a very good one! I also don't want you to have to buy the sometimes expensive gear used by painters who work outside all the time. That can wait until you see if you love it. The best way to enjoy plein air painting is to be well prepared and to take it one step at a time. Here are some tips for how to turn your current painting supplies and set up into something that will work outside. You'll need an easel and somewhere to put your palette. 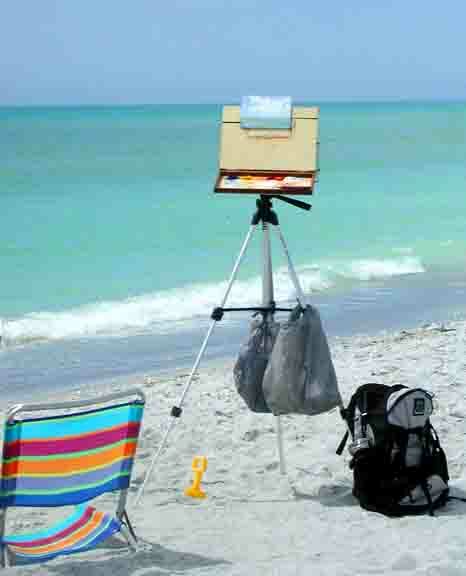 Experienced painters use either a paint box (called a pochade box) on a tripod, or a wooden French easel. I find the French easel cumbersome and heavy. My plein air setup is shown on the right. Everything but the tripod, including the paint box, goes inside the backpack. If you have a tripod, and have a painter friend who can lend you a pochade box, that's a great way to go for your first plein air session. Or if you're handy, you can make your own light weight pochade box of aluminum. Alternatively, any easel that you can carry and set up easily will work. 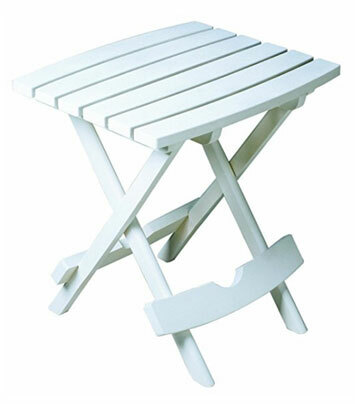 With a regular easel you will need a table for your palette. This is one that we use on our boat that is portable and reasonably priced. Here's a link to this table on amazon.com. While most plein air painters work standing up, I know some very good ones who paint sitting down. If you use a table for your palette, sitting down will put the palette at a better height. So bring a folding chair. A view finder is essential for painting out of doors. It let's you restrict your view to what you want you to include in the painting, and to compose using the aspect ratio of your canvas or panel. Here's a good one on amazon.com. Use small canvases, you will only have a couple of hours before the sun (and sometimes tide) changes. If you are a slow painter, go for 6"x6"s and 6"x8"s. If you paint faster or think a 6"x6" is tiny, get 8"x8"s and 8"x10"s. Canvas panels, as opposed to stretched canvas, are fine, especially for use with pochade boxes which have clips to hold them. Stretched canvas is fine too. Oil painters will need cups that attach to your palette for medium and for a small amount of clean solvent. Acrylic painters will need a spray bottle of water, paint dries even faster outside. A Masterson box with the sponge insert will be very helpful. Here's a link on amazon.com. Don't forget your hat, sunscreen, bug spray, and some water to drink. Our painting spots will have a restroom/porta potty close by. My materials list which includes paints and brushes is on this page.